If you're thinking of creating a patio or walkway this year, a patio paver calculator can help you determine the correct number of pavers needed for your project. It can also help you determine how many edgers you'll also need for a professional-looking design. Follow these instructions to use the free paver calculator below. This calculator provides an estimate for basic pavers and the patterns mentioned. More intricate designs will need a professional estimate. Measure the length and width of the area you want to place the patio. If you're planning a round patio, measure the diameter. Write down the measurements in inches. If you need to convert a fraction to the corresponding decimal point value, use the small gray box in the calculator below. The first white box is for whole numbers, the second for the numerator, and the third for the denominator. Click on "Convert to Decimal" to calculate the decimal value. Add your square patio dimensions (or round diameter) to the appropriately labeled area using decimal point values in inches. If you are doing a particular pattern, skip to step 7. Otherwise, measure your patio pavers. You will need the length and width. Enter them in the labeled areas. Click on the "Calculate Number of Pavers" button to find out the number of pavers to use. Do not continue with any additional steps; your calculations are complete. If you plan to do a particular pattern with your pavers, such as herringbone, skip steps 5 and 6 above. Instead, select the pattern desired from the provided pull-down menu. The pattern results are below the calculator; you'll find out the size and number needed to complete your design. It is important to go over your project with a professional to make sure your calculations are correct. No one wants to find out three-quarters of the way through their project that they are short on pavers. 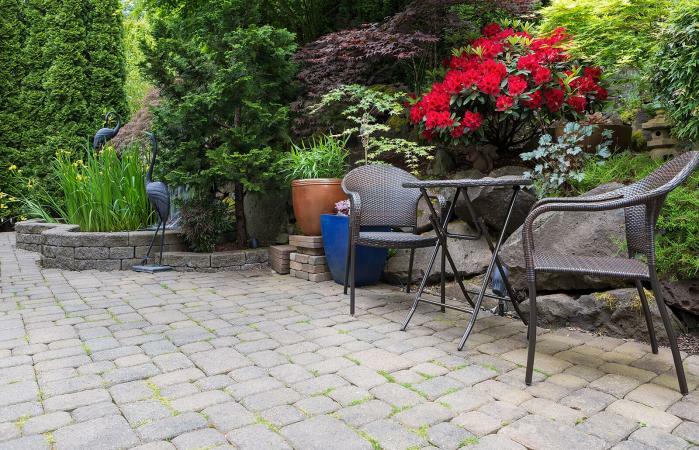 Before purchasing, find out if you can return unused pavers. This way, if you calculated incorrectly, you are not stuck with extras. Online paver calculators help to estimate what you will need for your project. On some websites, the actual cost may also be calculated for you. Many of these websites also offer tips and tricks for creating the perfect patio or walkway. Pro Patio: This site offers a paver calculator as well as step-by-step instructions on how to create a patio, from excavation to applying the sealer. Better Homes and Gardens: BHG offers a very simple calculator for your project. Enter the perimeter length in feet, and then choose the size of the paver. The calculator will do the rest. Monument Masonry: This site offers six different calculators for a variety of paver projects. It also gives specific instructions for the installation of your paver project. Oberfields: This site has a calculator for Belhaven, Lincoln, Monroe, Washington and Washington Circle pavers through their line of products. Paver calculators will give you the total square footage for your patio design. This same square footage can help you determine how much you'll need of the additional materials to complete the patio design. For example, you will need enough sand to fill the total square footage beneath the pavers. Always double check with a professional to be sure you have enough to cover the area. A paver calculator is a helpful tool you should use from the inception of your project. It will help you gauge approximately how many pavers you'll need, as well as give you an idea what the final cost will be. Always speak with a professional to determine the materials that you'll need for your project. They can double-check your calculations to ensure you have the correct number of pavers and edgers, as well as the amount of base material and sand you'll need to complete the project.